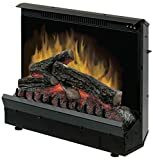 5 How Much Does It Cost To Run An Electric Fireplace? 6.2 Is It Safe To Leave The Electric Fireplace On Overnight? 8 How Does Electric Fireplace Installation Work? Adding elegance and style to your home whilst bringing much-needed heat to your room isn’t a difficult task when you choose an electric fireplace. There are so many different types for you to choose from and whether you already have a fireplace that you would like to cover with an electric fireplace insert, or if you would simply like to add a new electric fireplace to a simple room, there is sure to be something out there that will meet your requirements. We have some great electric fireplace reviews to help you to find out about some of the best models on the market today, whilst our comprehensive buying guide can be used as a tool to find out more about these heating appliances and to find out what you’ll need to look out for when trying to find the best electric fireplace to use as a heat source and focal point in your home. What’s better than a fireplace during the cold white winter. This Touchstone 80004 is made for in-wall mounting and is a really good choice for heating and decorating your living room. This unit is electric, it operates on 1,500 watts, with a voltage of 120 and you can forget about cleaning the flake of soot and the annoying ash. It can heat any kind of room up to 400 sq. feet. The black color of the frame gives a fashionable look and homey feel to your house or flat, or even the office. The luxury function here is that you can set the shine and the color of flames (an orange, blue or blue-orange). You can also choose between a soft or an intense blaze. There’s also a remote control. 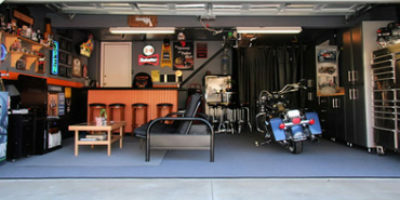 The installation is easy, and you can find everything you need to know in the user manual, but note that it is recommended to be mounted at least 12 inches below the ceiling and it shouldn’t be under a flat-screen television. The Cartwright Convertible Electric Fireplace is a traditional looking electric fireplace that will bring an attractive an authentic feature to your home. With some great features and high-quality operation, you can be sure that this will be the perfect fireplace for your home. The flames that feature on this fireplace dance around like real flames and they are multicolored. With lifelike burning logs and embers that pulsate, the visual effects on this fireplace couldn’t look more realistic. The interior of the fireplace is finished with a brickwork look to add further character and you will also be able to add down lighting for more illumination if you wish. The multimedia mantel allows you to place a flat panel TV of up to 43.5 inches in width and it can support a weight of up to 85lb. The surrounds of the mantel are frames with dark colored tiles that have earthy tones. 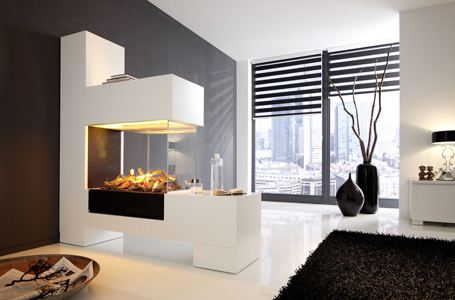 You could install this fireplace in a corner if you wish, or alternatively, it can be placed against a flat wall. This fireplace is able to heat a room of up to 400 square feet and it plugs into a standard outlet without any special wiring needed. The cord is 6 feet long to give you flexibility. 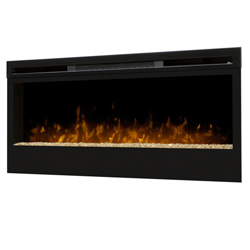 Reuse your old fireplace with this attractive and modern electric fireplace insert from Dimplex. You will be able to install it into your existing fireplace firebox without any difficulty as long as it will match the size of the fireplace opening. The 1375-watt output ensures that this is a powerful heater and you will be able to control it with ease from anywhere in the room using the remote control. This electric fireplace plugs into any standard electrical outlet so you can be sure that you won’t need any special wiring apart from a nearby electrical socket installation if you don’t already have one. To send the heat out into the room, there is an integrated blower fan. This fan gently forces heat outwards and disperses it evenly so that it can heat up space as quickly as possible. You can choose full heat, half heat or flame only modes so that you can make use of this fireplace throughout the year. Flame only will not produce any heat, but instead, it simply offers a pleasant focal point for your room. The adjustable black trim with black mesh kit gives you the ability to give a beautifully finished look. This electric fireplace stove is a great way of adding the authentic look of a traditional stove to your home without any of the cleaning or ventilation that comes with it. To provide plenty of heat, this stove produces 4,600 BTU of heat and it is suitable for rooms of up to 400 square feet. It is also freestanding so that you won’t need to worry about any costly installation. The stove housing is made from metal to give an authentic look and to provide strength, safety, and durability. It even has a full operation door with a working handle. Through the viewing window in the door, you’ll see the realistic angina flames with logs. The log bed even features pulsating embers to give an even more lifelike look. You can enjoy the look of this fireplace all year round without needing to unnecessarily heat your home as it can be used without the heat function if you wish. The stove itself stays cool to the touch so that you can use it safely in your home and it comes with overheat protection to prevent parts from becoming damaged and to minimize the risk of fire. 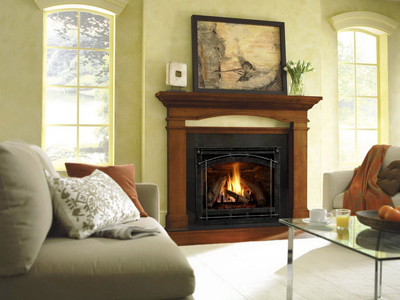 This stunning wall-mount electric fireplace from Dimplex is a beautiful and practical way of adding heat to your home. As this fireplace is wall mounted, you won’t need to worry about it being dangerous for pets or small children and the realistic looking flames are sure to be a success with your house guests. Every bit of energy that this heater uses is converted into heat for your home so you can be sure that you’ll get 100% efficiency when you choose the Dimplex BLF50 fireplace. If you don’t need to have the heating on in your room, there’s no need to turn off this heater. Simply turn off the heat and leave the flames dancing. The attractive display is soothing and enjoyable to watch. This is a lightweight heater that is simple to install on your wall. If you wish, you can install it on your own or with assistance. It is also easy to remove from the wall if you need to and to move it to another location. This is a great choice when it comes to electric fireplaces and you can be sure that it will bring modern characteristics to your home. Although this isn’t exactly a traditional looking fireplace, it is certainly a popular choice in modern homes today. 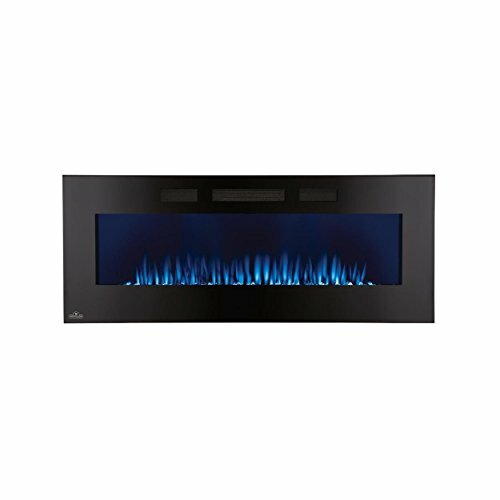 The Napoleon EFL50H Azure linear electric fireplace is designed for mounting to the wall to create a daring and attractive centerpiece for your room. Whilst offering you a great light show, this electric fireplace will also produce heat to keep your home toasty and warm in the winter months. The flames that feature on this fireplace are led and they give a great impression. You can choose the color that you want them to be as well as the way that you want the fireplace itself to look. Choose from crystals or logs for the base of the fire and then select the color of the flame. This is a quiet heater that won’t be an annoyance whilst it’s on. This enables you to watch the TV or even read a book whilst the fire is on. You can also feel secure in the knowledge that replacement parts are available for this fireplace if anything should ever go wrong with it. This is good to know, as there are many models of electric fireplace out there that can be costly and even impossible to fix. Napoleon itself is a great brand name when it comes to high-quality fireplaces and it is a manufacturer that has been around for close to 40 years. There is so much choice when it comes to buying an electric fireplace that you may be wondering where to begin. That is why we have included this buying guide to help you get a little more information about buying the best electric fireplace for your needs. When you buy a wall mounted electric fireplace, you’ll find that it’s will operate very easily. In order to use this kind fireplace, you simply need to plug it into an electrical outlet. The hardest part is screwing it onto the wall. Most wall-mounted electric fireplaces of very lightweight and easy to carry. Sometimes, you will be able to simply lefties up yourself and install. It is, however, easier to have another person helping you to install this kind of fireplace. Wall mount electric fireplaces are usually installed higher up on the wall. There are no restrictions as to where your wall mounted fireplace can hang, so what you will be able to place the fireplace out of the reach of children and pets. As you can see, with the flexibility of installing these fireplaces wherever you like, Wall mounted electric fireplaces are very safe. When you purchase a wall-mounted fireplace, you will realize that they look very modern and can add a unique appearance to your home. Whilst they are popular appliances these days, many people do still prefer the look of a traditional fireplace and choose not to opt for a wall-mounted fireplace. If you have an existing fireplace, you will be able to use it without making any drastic changes with the purchase of an electric fireplace insert. 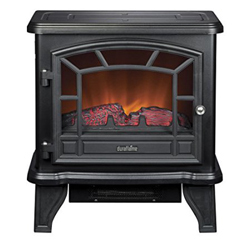 You can purchase these in two different types – electric log inserts and electric fireboxes. 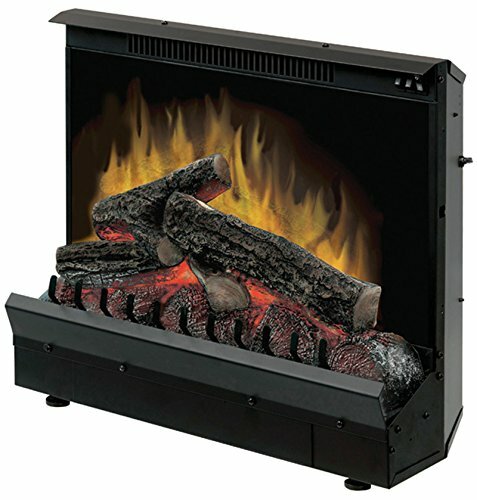 An electric fireplace insert will offer you a realistic looking and traditional flame and log appearance. Some of them even have ‘embers’ which glow to give an authentic look without any of the disadvantages of real fireplaces. You can also find plenty of different sizes of fireplace insert so that you can be sure to find one to match the size of your existing fireplace. Some features of electric fireplaces that you wouldn’t be able to have a real fireplace include remote control operation and temperature and flame controls. You can install these fireplaces with ease by simply securing them in a place where your existing fireplace is and then simply plugging the fireplace into a nearby plug socket. If you don’t already have a mantelpiece and you like the look of traditional fireplaces, you should consider an electric mantel fireplace. These mantels are specially designed to safely enclose a fireplace insert and they allow you to add supplemental heating to your home without needing to create any holes in the wall or carry out any invasive work in your home. The mantle of these fireplaces looks like a traditional mantelpiece and it will be a great decoration in your home. Often, there are also additional features built into these kinds of fireplaces. Many of them are remote controlled and others even have an integrated air purifier to improve the quality of the surrounding air. Stoves have been a popular way of producing heat for many years, but the problem is that they require ventilation and often, there is a lot of maintenance required with these heaters. 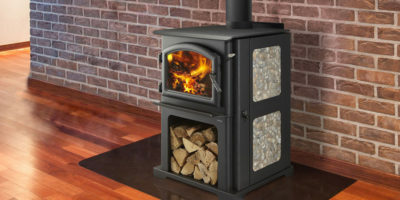 If you like the look of electric stoves, but you don’t want to install a fuel burning one, you will be able to choose an electric stove instead. Electric fireplace stoves are freestanding so you don’t have to worry about building them into the wall or even making any kind of ventilation for them. Simply plug the appliance into a plug socket and they’re ready to use. With no installation costs, these electric heaters are a great choice. You won’t have to worry about energy consumption either as these heaters are highly cost-effective. You can even control the temperature of the stove or turn off the heat altogether to enjoy the flame. The realistic fire effect in the stove looks impressive, and you don’t have to be too warm whilst relaxing near the fire thanks to the electric operation. Usually, electric fireplace stoves are suitable for heating rooms between 400 to 600 square feet in size. The different types of fireplaces that are mentioned above can be found as either fixed or freestanding fireplaces. The type that you choose greatly depends on your home and your own personal requirements. If you want to save money on the cost of having a fireplace installed, you could choose a freestanding fireplace. Using other furniture or simply standing them against your wall, you will be able to add a great looking heating solution to your home. This is also great for those who are renting or those who are unable to make any modifications to their home as these kinds of electric fireplaces simply plug into a plug socket and are immediately ready for use. If you are limited on space, however, you should think about getting a fixed and even a mounted fireplace. A mounted fireplace is usually a safe way of adding heat to your home and they are usually safe to install near a TV. Many people like to install them as a centerpiece and they require very little expertise to install. You could also install a mantled fireplace or a fireplace insert. Again, these need very little installation work. Electric fireplaces are often designed to make a statement in your home. If you have a particularly small home or room, you will need to ensure that you choose the electric fireplace that will be the best fit for you. Look out for oversized mantle fireplaces and wall-mounted fireplaces, especially as these, can be quite large. If you already have a location for your fireplace to go, you should ensure that you take careful measurements. An existing fireplace is a great place to install a fireplace insert, as it will mean that you don’t need to carry out any complicated work on your old fireplace. In order for the insert to fit, however, you will need to ensure that the size of the fireplace matches the size of the insert. When you are purchasing a wall-mounted fireplace, you should think about how large you want your fireplace to be. If you will be mounting it below your television, would you want your fireplace to be larger than your television or vice versa? The fireplace may become distracting if you have the flames turned on whilst you are watching TV. Whichever electric fireplace you choose, remember that it should be powerful enough to heat your room. You should measure the perimeter of your room and multiply the length by the width in feet to find out how many square feet your room is. Once you know this figure, you will be able to compare your figure to the values given in the product descriptions of the various electric fireplaces that you see. You will need to ensure that the fireplace can heat the area that you need it to. In order to produce heat, electric fireplaces use metal coils. These coils turn electricity into heat and become hot. A fan is integrated into the design of the fireplace and this blows the heat from the element out of the fireplace and into the room. The coils are the only part of the fireplace that becomes hot during this process and they don’t transfer this heat to the casing in any way, making the fireplace safe for you to use in your home. In addition to producing heat, electric fireplaces also usually feature a flame that looks realistic. The flame is created using LED or regular light bulbs and the light is then bounced around the flame area using refraction, which gives the impression of a live flame. 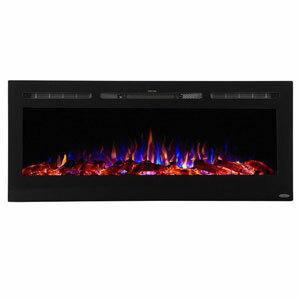 There are other types of electric fireplace too and these have a more modern and less authentic looking flame. You can either use an electric fireplace that is a freestanding complete fireplace or you can use a fireplace insert, which is placed into the firebox area where your existing fireplace is. Fireplace inserts are a safer alternative to using wood for a fireplace and they can be installed without needing any changes to be made to your fireplace. This can be a cost-effective way of repurposing an old fireplace and chimney area. Electric fireplaces are highly energy efficient. The heating element takes all of the electricity and converts it into energy. Around 1% of energy is wasted in this process. There is no flue or venting that is required for an electric fireplace so none of the heat can escape outside. This means that 100% of the heat that is generated by the fireplace is outputted to the room. Electric fireplaces are fast to heat up and they can cool down again relatively quickly when they’re turned off. You can use an electric fireplace in one of two ways. You can either use it as an ornamental feature by using the flame function only without heat, or you can turn on the heat and use it as a heater. It doesn’t actually cost all that much to run, however, even if you have both the flames and the heater running at the same time. The amount that you can expect to pay on the electricity depends on how much it costs in your area. If your electricity costs $0.12 per kW and you use a 1.5Kw fireplace, you can expect to use $0.18 per hour. If you have expensive electricity, you will find that the electric fireplace could become very costly to run. When you get your electric fireplace, you are certain to want to get it installed and working as soon as possible, but before you do, make sure that you are aware of these important safety tips to prevent injury or fire caused by the electric fireplace. Electric fireplaces plug into electric sockets for easy installation, but if the electric socket isn’t close enough to the heater, don’t be tempted to use an extension lead. It is easy to overload an extension lead and this can cause a fire. You should either move the fireplace closer to a plug socket or have an electrician move the socket closer. The heating element of your electric fireplace will become very hot when the fireplace is on. You should be careful around electric fireplaces to prevent getting burned from the casing of the fireplace. These fireplaces have a fresh air intake vents and vents to discharge warm air. You should ensure that the vents are never blocked so that the air can circulate properly. Never use the fireplace to hang anything on, for example drying laundry. When you are not using the fireplace, you should turn it off and unplug it from the electrical socket. This is especially important if you have children as they may become curious and try to press buttons on the fireplace. If it is unplugged, it can’t be turned on inadvertently. You should inspect the plug and the power cord frequently. It is not uncommon for wires to become worn or damaged over time and the power needed for electric fireplaces can even cause the sheathing on the wire to become damaged. If you notice that the wire is damaged in any way, you should make sure that you stop using the fireplace immediately and call a professional to service and repair the appliance. Always supervise children or pets near the fireplace. You should be aware of children trying to poke items into the vents as this could cause a fire. You should never install an electric fireplace in a bathroom or anywhere that is damp. You should also never have water or liquid near the fireplace. If you have an electric fireplace with a mantle, you should avoid placing vases of flowers on the mantel or using the mantle to rest drinks on. Electric fireplaces are designed to be safe and as such, you shouldn’t need to worry about leaving them on overnight. Although you may be able to safely leave your fireplace running unattended, however, you should still be aware that the problems that all electrical appliances face also affect electric fireplaces. To stop anything bad from happening when you leave your fireplace on overnight, you should be sure to follow some sensible safety protocols. You can leave the electric fireplace on overnight if you really need to so that you can prevent the temperature from dropping too low but if you can turn it off, this would be better. It’s always a good idea to try to turn off the fireplace altogether and unplug it when you are spending prolonged times away from it. When you leave your electric fireplace on, you should use the thermostat or temperature control to choose a reasonable temperature. Choose a level that would make you feel comfortable but not excessively warm. The thermostat will protect you against the fireplace heating up too much by switching it off when it starts to get too warm and then turning back on again when the temperature drops. You should make sure that you check all around the fireplace including on top of it to make sure that there’s nothing that could catch fire. You should leave a certain amount of clearance in front of and over the top of the fireplace. Ensure that no drinks have been placed on or near the fireplace. Using an electric fireplace costs money. Even on the lowest settings, it will raise your energy bill the longer the fireplace is left on. If you don’t want any nasty surprises in your bill next month, make sure that you turn it off. There are many great reasons why you should choose an electric fireplace for your home. Electric fireplaces come in all kinds of styles so that you can easily match them to your home’s décor. As electric fireplaces don’t burn fuel, they don’t produce any harmful gasses in the air and there are no fuels that need to be stored away safely. You can feel safer around electric fireplaces as they don’t become hot to the touch. There is also no risk of any embers jumping out of the electric fireplace. When you own an electric fireplace, you’ll realize that there is very little cleaning that needs to be done other than simply dusting. This will take you just a minute or two every week and you’ll be able to enjoy an easy to maintain appliance. Many electric fireplaces don’t have any special installation requirements. You won’t even need to hire a professional most of the time. You can simply place the fireplace in the position that you want it to be and immediately, it can be plugged into a socket and turned on. Electric fireplaces don’t have to be used for warmth. You can use an electric fireplace with the visual fire whilst turning off the heat. This allows you to create an attractive feature in your home all year round without wasting energy. How Does Electric Fireplace Installation Work? Installing an electric fireplace doesn’t have to be a difficult task. If you have chosen a freestanding fireplace, then this will be even easier to install. The first thing that you will need to do before you begin is to measure up your room. Make sure that the fireplace will actually fit and that there will be somewhere it can go without being obstructed. Next, you will need to check to make sure that there are electric sockets. You should never use an extension lead with an electric fireplace so make sure that you have somewhere to plug the fireplace into. You may need to hire an electrician to create a plug socket for you or to relocate an existing one. Now you can get your fireplace and put it in place. You won’t need to screw anything into the wall or make any changes to your home, as the heater will simply plug straight into the socket. To install a wall mounted heater, you will need to mark on the wall where you want the heater to go and then drill the holes for the mounting bracket. You will then need to secure the fireplace onto the wall. If you have ever installed a large flat panel television on the wall, then you should have no problems with installing a wall-mounted heater. When you install an electric fireplace, it is important that you position it carefully so that there is enough clearance all around it. You should measure your room and the area that you would like to place the fireplace so that you can be sure that it will be completely safe to use it. Installing a wall mounted or fixed fireplace is a good idea if you have a limited amount of space. You should be sure that nothing stands directly in front of the fireplace and that there are around 3 to 6 feet of clearance. This will prevent anything from catching fire. When you are installing a freestanding fireplace, you should also be sure that there would be nothing near the fireplace that could fall and knock the fireplace over. Remember that there should also be clearance above the fireplace and you should be very careful about what is placed on the mantel if there is one. It can be tempting to place a vase with water and flowers on the mantel or even to momentarily rest a drink on the mantel, but you should always keep liquids and drinks away from electric fireplaces. Just like with any other electrical item, these electrical space heaters are not designed to guard against water. Whether you want to add the look of a traditional heating appliance to your home or if you want an ultra modern looking focal point for your room, you’ll find more designs of fireplace available on the market thank you could ever need. The great thing about having so many choices of fireplaces is that you will certainly be able to find the right electric fireplace for your home. You should make sure that you know exactly what look you want from the fireplace and the kind of impression that you want to give as well as knowing the dimensions of your room so that you can be sure that it will fit. Our buying guide is full of safety information and tips to help you to find and make the most of your new fireplace. These electric fireplace reviews also give you some good insights into a variety of some of the best electric fireplaces on the market today. Looking to replace my fireplace insert have the model number SP18-1705-LED. It’s essential home,Frederick fireplace by Prokonian.